We're still enjoying a few more days of warm summer heat here in Colorado, before the autumn temperatures kick in. The plants in our gardens are still hard at work, and a friend kindly bestowed some lovely home-grown grape tomatoes which are growing abundantly in her yard. My kiddo loves snacking on raw tomatoes, but managed to spare a few for me to whip up a batch of homemade barbecue sauce, to go with our ribs for dinner tonight. Puree all the ingredients in a blender, and store in the refrigerator. I served my sauce on the side with our Kansas City-style ribs, adding a lovely fresh, tangy flavor. Raia at Delicious Obesssions suggests slathering it on meat, prior to cooking as well. 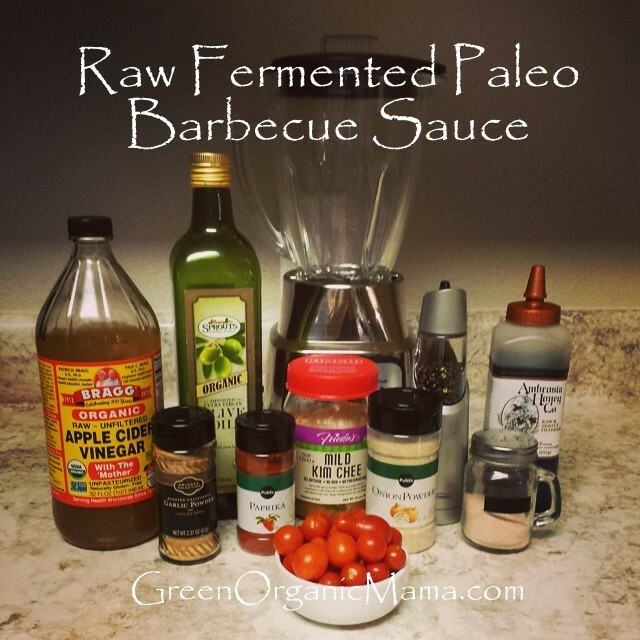 We'll definitely try this as a marinade, too. It's been way too long since my last post, with many, many changes since. In a nutshell, I'm now a very happy single mother, continuing to raise a Paleo daughter, but instead of in the island community of the Florida Keys, we're now enjoying life in the Rocky Mountains of Colorado. It is just gorgeous out here! We are loving our new home. This morning, we were having a discussion on The Paleo Approach Community's Facebook page about dealing with eye strain; specifically from the blue light emitted from our beloved electronic devices and computers. 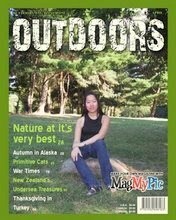 During my blogging hiatus, I was engrossed in another of my favorite pastimes; computer gaming. Talk about eye strain. LOL! 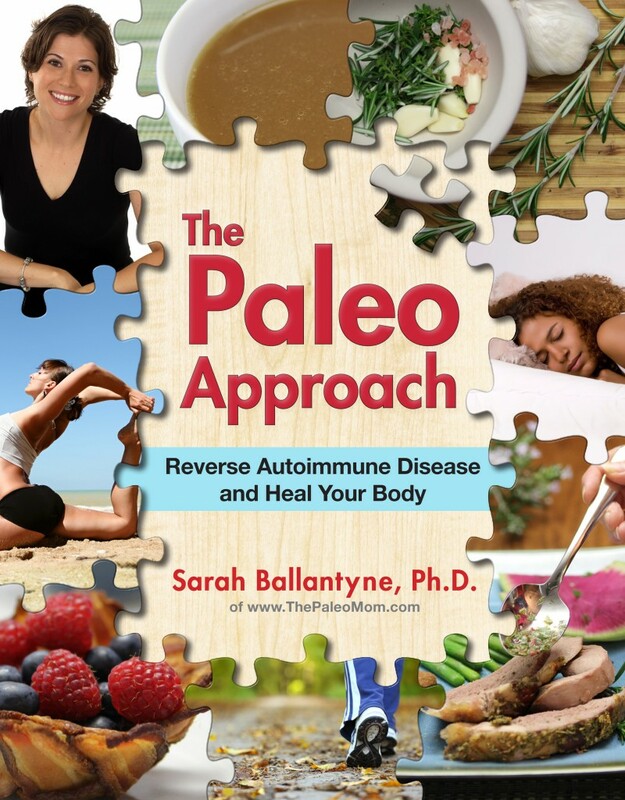 At that point, I had been Paleo for three years, taking plenty of extra Omega-3 to minimize inflammation and help with eye health, using the most moisturizing contact lens solution money could buy, and had cartons of preservative-free eye drops at home and at work. Nothing was helping my tired, dried-out eyes. That is, until I was talking to a fellow gaming friend and he told me about a free program called F.lux. F.lux is pretty awesome. And did I mention it's free? It automatically determines your geographical location, in relation to sunrise and sunset, and uses preset timers and settings to comfortably dim and warm the colors of your screen. No fuss, no muss. I now install that on every computer I own, and work computers as well. 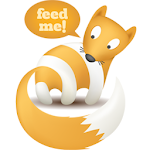 Click here to go to the F.lux site to download for your PC, Mac, iPhone/iPad. For those of us who love our Android phones, another poster suggested the Twilight app. I'm going to give that a whirl and see how that goes. I started out with a very expensive, $100 pair of Gunnar glasses. I love the look of these, but truly, they work just as well as my cheaper, backup pair of Gamma Rays, that only cost $25. Once I started using computer glasses in combination with F.lux, the eye strain went away immediately. No more drops needed, either. It's inevitable: tucked away in the corner of the kitchen, the overripe bananas, wasting away, that nobody wants to eat. Like me, you buy them firm and bright yellow, with such good intentions, as a super easy, grab-and-go healthy snack for your family. Yet before you know it, one day you pass through the kitchen, and spot the browning, neglected mass, that's now way too sweet to eat. What's a parent to do? My Pinterest followers know I love my smoothies, too! One of my favorite tricks for saving those overripe bananas is to peel them and break them up into chunks, and then store them in the freezer in a zip-top bag. I then grab a few frozen pieces and toss them in the blender, along with my other smoothie ingredients. Very convenient for adding a little natural sweetness, thickening the smoothie, and helping chill it, too, without watering it down with ice. 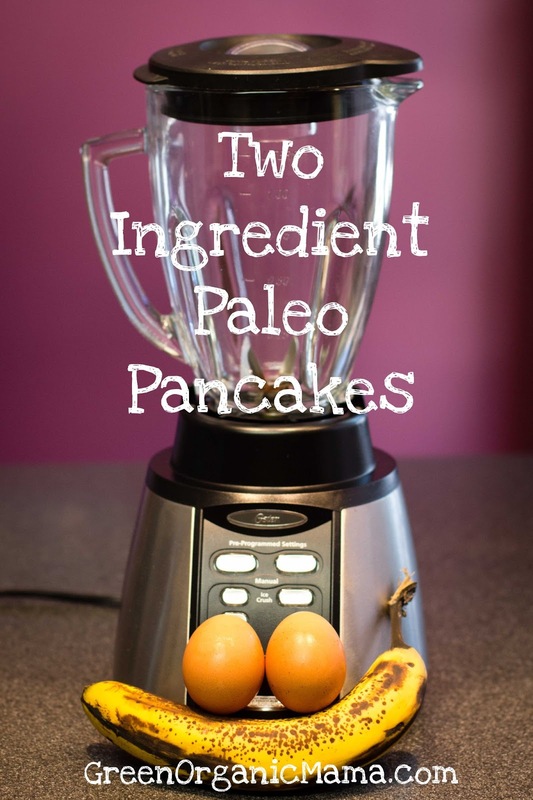 Today, we have to thank Just Eat Real Food for sharing The Domestic Man's super simple recipe for another easy and delicious way to use up those overripe bananas: Two-Ingredient Pancakes. What a great departure from our usual bacon/sausage/scrambled eggs, with this healthy breakfast addition. This dish is on the table in no time flat! No sweeteners needed, either. My daughter gobbled up the pancakes, faster than I could fry them up! We'll definitely be making these again. Got bananas? Got eggs? That's all you need for this very easy recipe. Here's how we made ours. 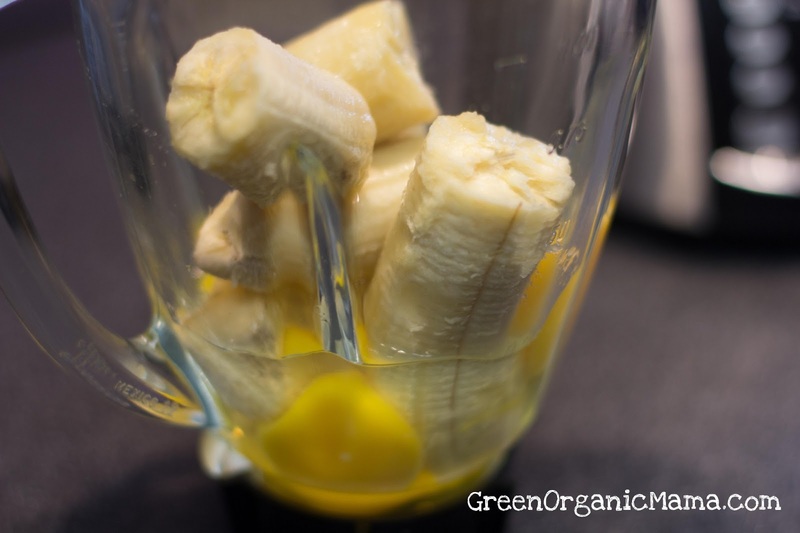 Combine eggs and banana in a blender on low speed (or mash and blend thoroughly with a fork). Grease skillet with bacon grease (substitute with coconut oil/butter/ghee). 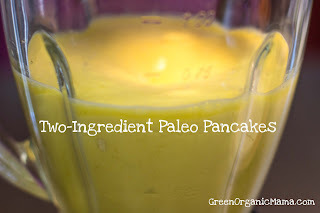 Fry each pancake until golden brown (about two minutes per side). Organic Skin Care Sale! Free $21 Moisturizer with $30 order! Hi Everyone! Hope you're having a great MLK weekend. I'm truly in love with this incredible line from Neal's Yard Remedies. Based in the UK, this carbon-neutral, eco-conscious, family-owned company has been in the business of organic skin care and natural remedies for over 30 years. It's so great to find a company with such solid core values, behind these unmatched products. 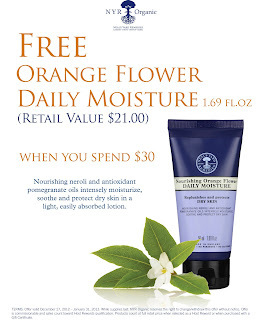 Today, I'm here to introduce to you their Nourishing Orange Flower Daily Moisture. This lovely neroli-scented lotion is now my go-to daily moisturizer for my face. While it's made to nourish dry skin, I find it's been just right for my combination skin, and absorbs right in, with no greasy film. Unlike other brands of moisturizers I've tried over the years, I've had no issues with any of the Neal's Yard Remedies moisturizers under my makeup. In fact, I find they absorb even faster than other brands, and I don't even have to wait, before starting my makeup application. I love, too, that like all Neal's Yard Remedies products, this is free of artificial fragrances, has no petroleum products, it's phthalate-free, and not tested on animals. All of their products are carefully hand-crafted in the UK, and are full of high-quality, concentrated, natural ingredients. Just a little goes a long way, to provide just the perfect amount of moisture, that lasts all day. To welcome in the New Year, all $30+ orders placed before 1-31-13 will include a free tube of this Orange Flower Daily Moisture; a $21 value! My friends and family have been loving this moisturizer, along with their other NYR Organic goodies. Don't forget to check out the other specials this month, with many favorites from 15-20% off, including our Organic Essential Oils Trio collection. Please check out the incredible deals, and hope you'll take advantage of this fantastic sale! Please contact me with any questions about these products, for special shipping deals, and to learn how to become an NYR Organic consultant yourself! I am an independent consultant for NYR Organic US. Links within the post are to my online store. This is a review of personal purchases. Happy New Year, everyone! Hope you had a wonderful holiday season! Christmas is always a special time for our family, but after all the holiday treats (and food cheats) it's always a relief to get back to our normal routine afterwards. Last night, we enjoyed some comfort food: oven-roasted chicken, and a very simple, yet delicious side of roasted cabbage. This was so easy to put together, very budget-friendly, at less than a dollar for a whole head of cabbage, and an excellent way to get some more cruciferous vegetables in our diet, too. You can easily add and roast extra heads; enough to feed a larger crowd. 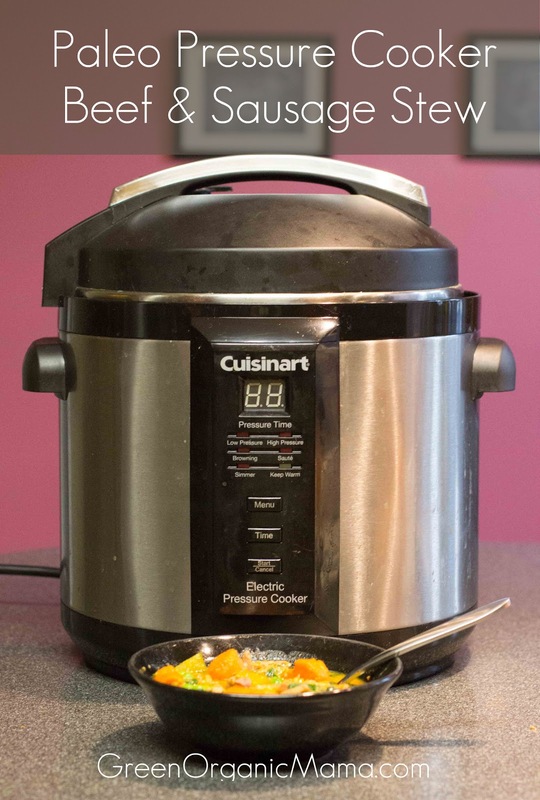 It's also a convenient dish, that can roast right alongside with your main course that's already in the oven; a real time-saver. Halve cabbage head, and cut out stem. Arrange cabbage wedges in a parchment paper-lined baking dish. 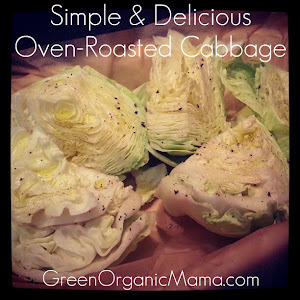 Drizzle cabbage with extra virgin olive oil, and sprinkle with sea salt and black pepper. Roast uncovered for about 25 minutes. The cabbage came out really tender, juicy, and mild. A great accompaniment to our chicken, and many more dishes to come! It's that beautiful time of year again. Our family is certainly getting into the Christmas spirit here, breaking out the decorations, and enjoying some holiday baking together. 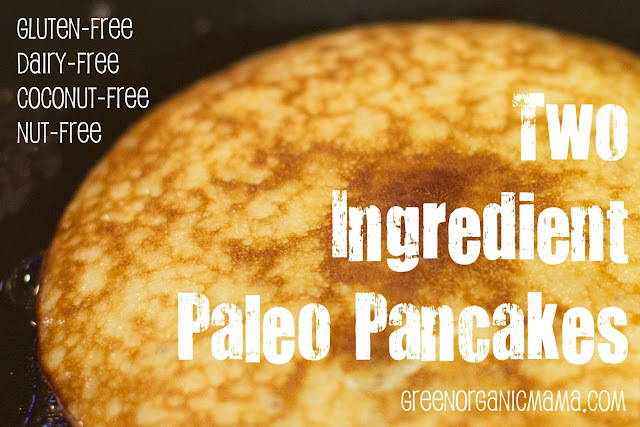 We're delighted with all the amazing, gluten-free Paleo recipes that are being shared, and hope to try as many as we can! Last week, I shared with you a review of our newest toy: a Nostalgia Electrics Cake Pop and Donut Hole Maker. 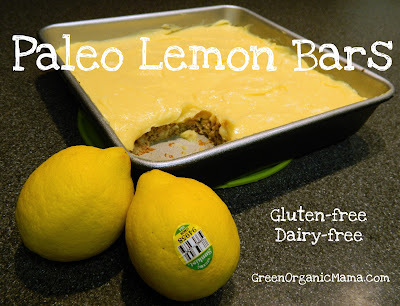 This really is a nifty little kitchen gadget, that turns out amazingly good baked treats that are totally Paleo-compliant, with virtually no mess, in very little time, and without the need to fire up the oven. 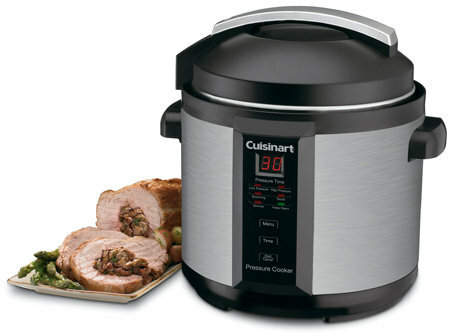 For those still shopping, this would make a great gift for under $25, for anybody who loves to cook. 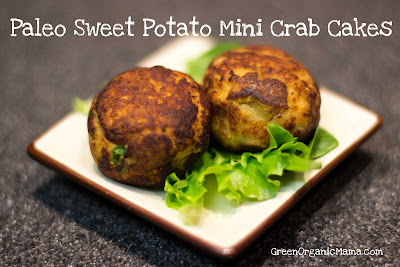 Aside from sweet treats, I managed to create this very easy and tasty recipe for savory Sweet Potato Mini Crab Cakes. They turned out wonderfully, and will definitely be on the regular recipe rotation in our household. I couldn't believe how fast the cake pop maker turned these out; taking only seven minutes to completely cook through to light, fluffy, golden-brown deliciousness. I wish I had picked up one of these machines sooner! Once again, I have to thank Lea over at PaleoSpirit.com for inspiring this whole cake pop/donut hole adventure, with her recipe for Paleo Apple Cider Donuts. Lea has an actual mini donut maker, but her recipe worked perfectly in our cake pop maker, too. We have a couple takes on Lea's recipe now. The first couple times I made these, I didn't have any apple cider in the house, so I substituted the same amount in orange juice. That transformed the recipe into wonderful, moist, little orange spice cakes, and I highly recommend giving that version a try, too. Here's now our cake pop/donut hole version of Lea's original recipe, which my daughter also helped decorate for the holidays. Not to worry if you don't have a cake pop maker or donut machine: a fan from Facebook has successfully made this recipe in her mini muffin pan, baked at 350 degrees F for 10 minutes. I've also included our recipe for the optional glaze, which is easily made corn- and dairy-free, by making your own homemade powdered sugar, and substituting coconut oil for butter. Simply combine a cup of granulated cane sugar in your food processor with a tablespoon of arrowroot starch, and pulse, to make a good Paleo substitute for powdered sugar. Kids of course love any kind of sprinkles and decorations (not exactly Paleo, but more for the presentation and fun-factor). Still, my favorite was topping these off with cinnamon and sugar. That really helped the flavors shine through. Experiment and be creative! In a medium bowl, whisk together eggs, coconut oil, and honey. In a separate bowl, combine the coconut flour, baking soda, pumpkin pie spice, and salt, breaking up any lumps. Add apple cider, and stir until evenly combined. Using a cookie dough scoop or small ice cream scoop, fill a heaping mound of batter into the compartments of the donut hole maker. Close the lid, careful to latch tightly, and set your timer for four minutes. As the machine is very hot, using oven mitts, carefully pick up the donut hole maker and flip it over onto its front side, onto a heat-safe surface. This is the secret to having nice, uniform, evenly round and browned results. After four minutes, unplug the donut hole maker, and flip it back over onto its back. Let it continue to cook for three more minutes. There is enough residual heat to continue the cooking process, without over-browning the outside edges. After three minutes, carefully open the machine, and transfer the donut holes to a cooling rack. Allow to cool fully before attempting to frost and decorate. While donut holes are cooling, prepare the glaze and toppings. To make the glaze, in a small bowl, combine butter/coconut oil/ghee with powdered sugar, incorporating half a tablespoon of powdered sugar at a time, mixing thoroughly. Add water incrementally, to form a smooth, slightly runny paste. Dip cooled donut holes in glaze and decorate with sprinkles and/or cinnamon-sugar blend. 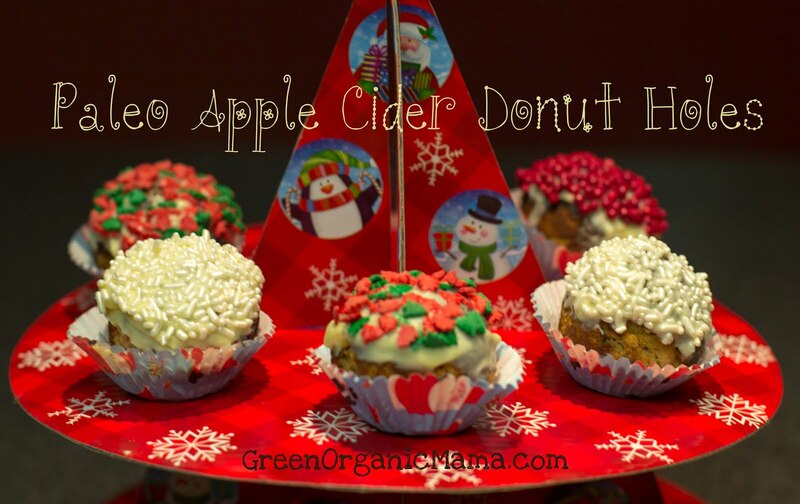 Our first batch of these holiday donut holes turned out great, and we can't wait to make more to share with our friends and family. We certainly hope you will, too! 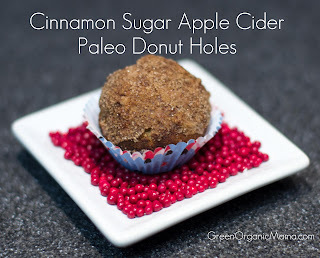 Many thanks to Lea over at PaleoSpirit.com for sharing an awesome recipe that inspired this treat; her special Apple Cider Paleo Donuts, that she made in a counter-top electric mini donut maker! Delectable, sweet, cakey donuts were certainly something I'd thought I'd never eat again, once going Paleo. Glad Lea was here to prove me wrong ;) As fate would have it, while at my local grocery store, I looked down and saw this adorable little cake pop/donut hole maker, and it was even a few dollars cheaper than Amazon! I couldn't wait to get home and try Lea's recipe. It was so quick and easy mix together, and seven minutes later, we were enjoying Paleo-compliant, gluten-free, yummy little donut holes. Definitely a new family favorite. This is a great little machine. Right out of the box, it's very non-stick, and I didn't have to apply any extra grease, before cooking. Just do be careful, as the machine does get very hot on the outside. Wear your oven mitts! I also set the machine on top of a trivet, to protect my counter top. There are red and green indicator lights, to let you know when the machine is properly heated, and I love the locking latch. More on the importance of this latch later. This particular model produces seven ping-pong-ball-sized cake pops/donut holes, and works best with denser batters, like you'd use for muffins or cupcakes. A cookie dough scoop makes it easy to measure out a good heaping dollop of batter into each compartment. Then just snap on the lid, and let the baking begin! Today, I decided to experiment with a savory recipe. While at the grocery store, I also got a great deal on canned wild-caught crab meat. 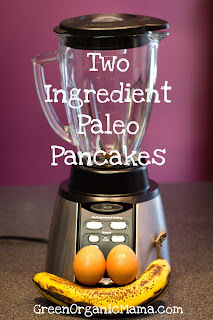 That sparked an idea for Paleo sweet potato crab cakes, but without the splattering mess of trying to pan-fry them. This recipe works great in this counter top donut hole maker, but you can easily adapt this for use in the oven, and bake into little muffins. Fifteen minutes at 400 degrees F should do it, or as soon as they're golden brown. On to the recipe! Preheat your donut hole maker. Combine crab meat, eggs, grease, sweet potato, green onions, and coconut milk, and blend thoroughly. Combine remaining dry ingredients, breaking up any lumps in the coconut flour. After three minutes, carefully open the machine, and transfer the donut holes to a cooling rack. 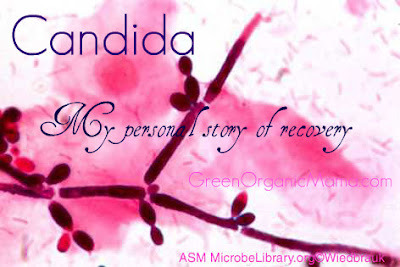 Serve warm with a nice organic side salad. It was so much fun putting these together, and I love that there was so little to clean up. No splattering mess from trying to fry anything on the stove top, and once the donut maker had cooled a bit, it was easy to wipe clean with a damp paper towel.